If you are anything like me, you’ve been receiving matching funds requests and invitations to give in your mailbox and inbox, for days. Especially today, as we count down the final hours of 2014, the emails are coming with greater speed and volume. And I understand; everything costs money. Sending letters, hosting websites, meeting with clients, networking…it all costs money. Cru City-Spokane is a faith-based organization with no central funds for paying for anything…I totally get it. Most will agree, too, that you can always use just a little bit more. But on this final day of 2014, as your inboxes and mailboxes fill with requests for support, I want to take a moment to celebrate what God has provided!! Cru City-Spokane has seen hundreds of dollars, mostly unsolicited, come in during the last twelve months. We are finishing the year without a deficit, which is miraculous…loaves and fishes stuff, truly. 2015 is ripe with opportunity. God is opening doors in exciting ways and unexpected places; speaking, teaching, engaging in reconciliation, international mission trips, leadership development, and strategic alliances are all on the horizon. And while we have no idea how God is going to provide the necessary finances, we are confident He will. So, we’re thanking God in advance for providing, and celebrating what He has provided. And we want to invite you to celebrate with us, too. If you have a praise report, on anything at all, please leave a comment below and let us celebrate with you! For most of my life, Christmas has been a time of wonder and magic, and not because dreams come true. Christmas has been a wonderful time because for as long as I can remember, family has come together for laughter and merry making, all centered around the birth of Christ. Oh sure, there may have been some conflict here and there, but my childhood memories are free of such distraction. Even my adult memories have been mostly joy-filled. A few times, however, life has been anything but merry over Christmas. One of the hardest was twelve years ago when I was grieving the death of a precious baby girl delivered into the arms of Jesus far too early. It is tradition to decorate for Christmas the day after Thanksgiving. But I didn’t want to; I was still so devastated from my loss that it was virtually impossible to even think about being merry, let alone invest the energy to make it happen. Our then 7 year old daughter, however, would have nothing of my humbug attitude. Single-handedly, she got the decorations out, and engaged everyone in helping put them up, even her Scroogely mama. I will never forget how God worked through that time, or through that precious girl. Fast-forward twelve years, and once again I am facing a holiday that isn’t quite so merry. The reasons are different, but the heartache is all too familiar; disappointment and loss, well seasoned with rejection. The enemy’s lies are mingled in, making today not quite so merry as it has been in years past. And I find myself at a cross-roads. Today is supposed to be so fun, the highlight of the year. Families gather to exchange gifts and laugh. Most of my Christmas memories are sweet and joy-filled. Do I let the pain I am experiencing today overshadow the joy of what we are celebrating? Do I allow the one who comes to steal, kill, and destroy steal my joy, kill my excitement, and destroy my holiday? Or will I allow the Spirit of God to comfort me, sooth my wounded heart, and fill my soul with joy that is not dependent on circumstances? And what will life look like if I do? Honestly, I am wrestling right now…that’s why I’m writing. It is far easier to write about walking through heartache than it is to actually do it. And to walk through with grace, keeping my eyes on Jesus instead of my circumstances…that feels almost impossible at this moment, truly. A dear friend told me recently that I need to focus on the big picture, not the brush strokes. And today, in reality, is just a brush stroke…just one single brush stroke on a room-sized canvas. It feels like a huge black splotch, but since I know the Master who holds the brush and chooses the paint, I know what I’m experiencing isn’t an accident. And, if I can step back from the momentary pain (as overwhelming as it is) to gaze in the face of my Savior, I can live as though it is true that God holds the brush and chooses the paint. But that choice is more difficult to make than it might at first appear. It requires experiencing the pain. It requires acknowledging the heartache. And it means letting go of both…which is also hard. God holds the brush, and He controls the paint. He is a master craftsman and I can trust Him. Even when it doesn’t make sense. And I pray that everyone else who is struggling on this festive day, for whatever reason, will be able to step back from the moment and gaze at the big picture, seeing both the brush strokes and the Master Craftsman who holds the brush. And in seeing, be able to rest, embracing the comfort and peace He offers, as difficult as that may be. The last few weeks have been some of the most painful in my entire life. Worse than when my first pregnancy ended in miscarriage…worse than when subsequent babies died…worse than when my sister died and we were abruptly reassigned. Pain I didn’t know could be experienced has overwhelmed my world. And new injuries are coming almost every day. It has been emotionally, mentally, spiritually, even physically exhausting. In the process of seeking the Lord (because I absolutely can not cope with this on my own) Job has come to mind. But, perhaps, not for the reasons you may be thinking. A cursory reading of Job will provide some powerful passages and examples on how to deal with adversity and grief. Yet, it is the opening chapter to which I want to draw your attention. After God gives Satan permission to “stretch out [his] hand and touch all that he has”, Satan does! Verse thirteen says that Satan picked a day when Job’s children were having a great time partying at the oldest brother’s house. Who knows what the weather was like…the kids were partying, it probably wasn’t too bad…but Satan unleashed a storm of epic proportion. First, Sabeans took Job’s oxen and donkeys, killing all but one servant, who brought news to Job. Scripture says “while he was yet speaking” another servant brought more bad news; all of Job’s sheep and the servants tending them, save one, had been consumed by “fire from heaven”. “While he was yet speaking” another servant came and described how a Chaldean raiding party had come and stolen the camels, killing all those who cared for them except one. And while he was still speaking a servant came to deliver the final blow…his seven sons and three daughters were dead, killed in a freak wind storm that destroyed the home they were in. After Job’s entire life had been destroyed, he fell on the ground and worshiped. Wow. That is not the response I’ve had. When I’ve been driven to the ground, it has been in pain and grief…it has been to cry out in misery. It hasn’t been to worship. And while I wasn’t there and can’t speak to Job’s state of mind, I’m not thinking this was a “sacrifice” of praise, either. It sounds like his natural reaction was simply to praise God!! Wow. I am not Job. I am so not Job. On one hand, that makes me very happy, because it doesn’t take very long to recognize that his life is not one I’d like to experience?! Yes, he had way more wealth than I can imagine, and God restored both his wealth and his family. But the journey he took, the abandonment by his friends, the rejection and blaming he experienced, even his own wife begged him to “curse God and die” because watching him suffer was so awful. Through this process of experiencing more pain than I realized was possible, God has given me a sneak peek into my unregenerated heart. It is ugly! And Hell hath no fury like a woman spurned, even (or especially?) if that woman is a mama. Some of what I’ve seen in my heart is ugly ugly ugly!! Most people would probably think of me as a fairly good person, a good Christian, a good missionary. I don’t drink or smoke or chew or spend much time with those who do. But my home will never be on the cover of Better Homes & Gardens. Martha Stewart will never feature my home or ideas on her network. We’ll never have a reality show like the Duggers (though people have suggested it…but ours would be a tragic comedy along the lines of AFV meets Duck Dynasty, punctuated by screams or panic attacks or old fashioned tantrums…sometimes by Mommy, lol). In the end, though, however good somebody looks (or doesn’t look), God’s Word is true, in our flesh dwells no good thing. Enough to care for Job in his grief and pain. A simple truth, but so profound. God loves the world. It is our privilege to help connect people in Spokane to the heart of God. And sometimes it is scary. Sometimes God asks us to do big things, that are clearly beyond our own human capacity. And sometimes, if feels like it is all about me, my ability, my personality, my creativity, my popularity (or lack thereof), my performance. Since I’m a broken, imperfect person, I fail. Often. Depending on my ability results in epic failure. Repeatedly. Recently, God challenged me to step out in faith and take on a new responsibility. It is scary. I don’t want to do it. I could fail. In the process of seeking the Lord’s direction (because I’m much more concerned with my performance than with obedience), I called a dear friend who is also a spiritual mentor. Instead of telling me how crazy I was for even considering adding something else, she began asking probing questions. Difficult questions. Questions I neither wanted to consider nor answer. But consider I did. And God revealed that I have some deep rooted fear; fear of failure. He also revealed something else. It’s not. about. me. Nothing in this life (or the next) is about me! And, my obedience is more important than my performance. Regardless of how well I perform, my success is determined by my obedience. Sometimes, God gives really strange instructions! He told Jeremiah to take his belt off and bury it. Then later, God instructed Jeremiah to go back and dig up that same belt, then to wear it to preach a message to the Children of Israel. He told Hosea to marry a prostitute! And, Hosea experienced great heartache as a result. Those are extreme examples, yes, but examples, all the same. Honestly, if you think about it, instructing a man to marry a woman who was already pregnant, with Someone Else’s child, or using shepherds as messengers, or having old women carry babies, or sending His Son as a common man instead of a king – those are all pretty crazy, even outlandish things to do. But God has done them. 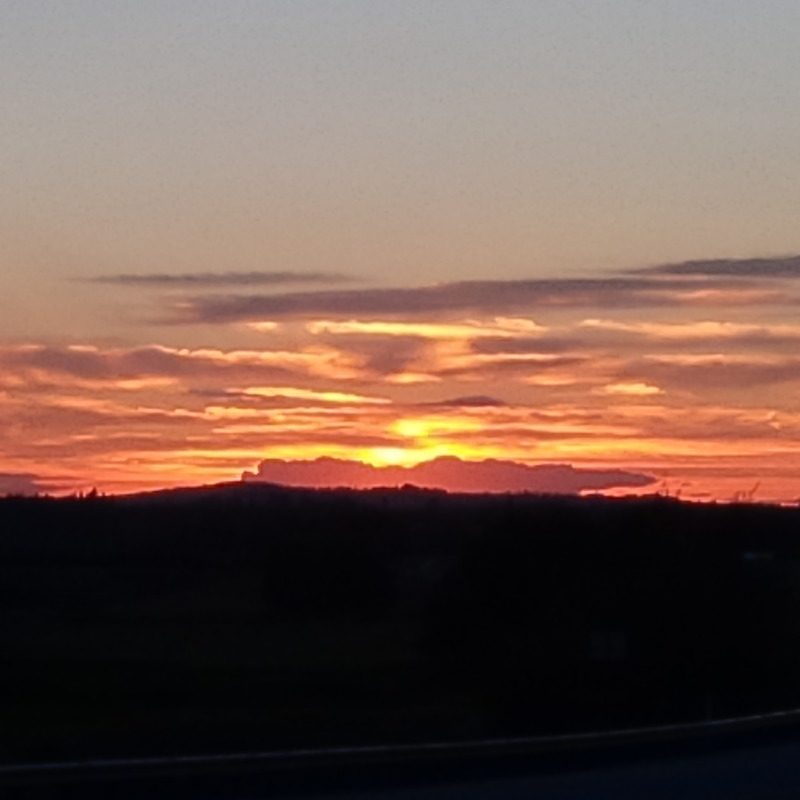 And God continues to do outlandish things. Things like adopting Gentiles, and opening His Kingdom to “publicans and sinners”. He so totally blew the Pharisees away (to the point that they wanted to kill Him) because He didn’t fit inside their carefully constructed facade. In their eyes; indeed, in the world’s eyes, Jesus wasn’t much of a success story. Even today, he wouldn’t have been a success, not by our usual metrics of numbers and impact. Jesus left a ragtag bunch of social misfits, and only a handful at that. He didn’t launch any new movements, He didn’t leave any beautiful buildings, He didn’t transform His culture overnight. He didn’t even chase the Romans out of Israel?! But He was completely successful…He was totally obedient and accomplished everything His Father gave Him to accomplish. As a result, He completely changed the world. And because that ragtag bunch of social misfits took the Great Commission seriously, they went and made disciples, who made disciples, who made disciples, to the point that, after about three hundred years, the Roman Empire looked nothing like it had in Jesus’ day. And eventually, disciples of disciples went to the ends of the earth, and people in the Pacific Northwest (which is about as far from Israel as you can get) are followers of Jesus as a result. Such a simple verse, but what a profound, life-changing, world-transforming concept…we can connect with the heart of God! Have you ever seen an ad (or a movie) where someone does a good deed, and before you know it, a whole community has joined them? Yeah; me, too. Those images always leave such warm fuzzy feelings in my heart. And I want to be part of something special like that. My experience, however, hasn’t quite played out that way. Honestly, I’ve done lots of good deeds all alone; no one has ever known. You probably have, too. Almost nobody notices. Virtually nobody remembers. Nobody is cheering, or giving awards, or helping with the efforts. You can probably think of your own examples; times when you gave even though (or especially because) nobody was watching. The goal isn’t to be noticed; good deeds have their own intrinsic reward. But sometimes it seems like somebody somewhere should care that you’re making sacrifices to benefit someone else. Perhaps you’ve never done it, but sometimes I figure if someone is doing a good deed, it must be because they have time. Or it is convenient. Or they don’t have anything more important to do. But, if they are anything like me and you, most of those people do have something else to do, and helping isn’t necessarily convenient, and they really don’t have any more time than we do. They are just choosing to use it differently. Why, you may be asking, am I bringing this up? Well, let me tell you. It is because God gave me an object lesson, in the sleet and rain. We live on a busy street. 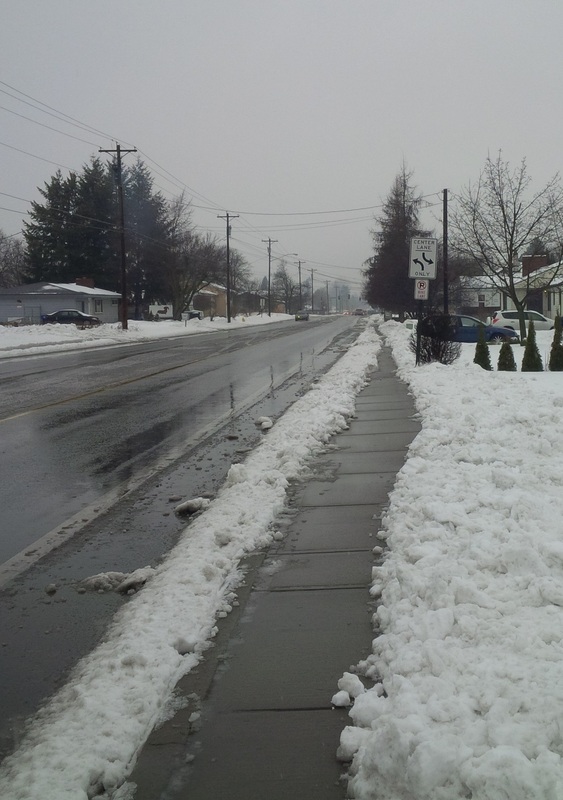 And we are responsible to keep the sidewalks clear. 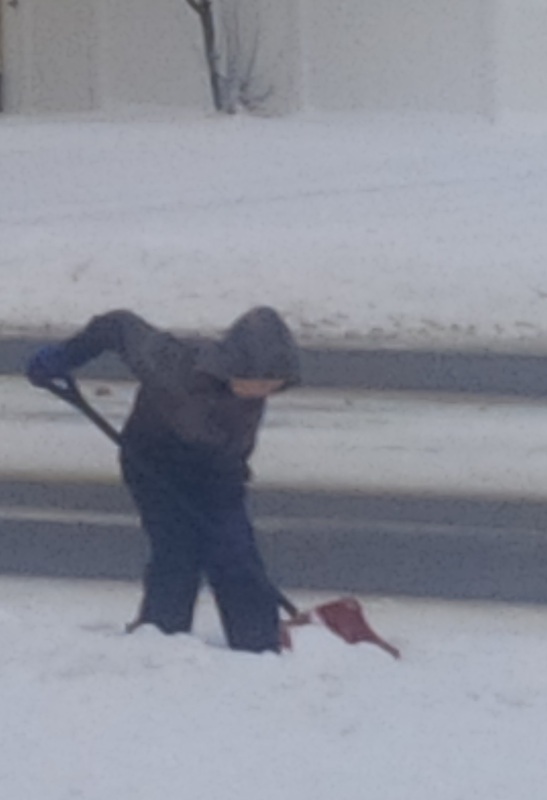 Initially, my son wanted to shovel the snow; he loves shoveling, and wanted to earn a littl e bit of money. But, as the sleet turned to rain and the snow got heavy, I knew he wouldn’t be able to get the job done. So, we traded places. And I started shoveling. My plan was not to shovel that long; I just wanted to get the snow off the sidewalk so pedestrians would be safe (and we wouldn’t get sued). But as I approached our property line, God started tugging at my heart. Our neighbors hadn’t gotten their sidewalk shoveled yet. I needed to shovel their walk, too. So, I kept shoveling. And as I did, God and I wrestled, a lot. I didn’t want to shovel for my neighbors. They haven’t always been very friendly. On occasion, they have been decidedly unfriendly, actually. And it was wet, and cold, and I had other things to do. And when the big vehicles drove by, they splashed gross mucky slush up on me and the sidewalk, further weighing down the already heavy snow. And because I’m not perfect, I wanted somebody, anybody, to help me. I wanted God to turn back time so I could accomplish my oh-so-important to-do list. I wanted somebody to notice and say good job. I wanted something. And, because I’m not perfect, God heard all about what I wante d.
Thankfully, I wasn’t struck by lightening (which I really did deserve), and God showed me that what I needed was an attitude adjustment…to praise God in every circumstance, even this one. So, I offered a sacrifice of praise, thanking Him that I can still shovel snow at my age (not that I’m that old, mind you), that I had the tools to do the job without freezing (gotta love modern conveniences like waterproof boots, insulated gloves, and warm coats), that I have a sidewalk to shovel (I could be homeless, or live in a tiny apartment with downstairs neighbors who hated living under an elephant herd), that I have a shovel, and that I have neighbors to bless with a simple act of kindness. Mostly, I chose obedience; I chose (what felt like) a long obedience, in the same direction. And, the job got done. More than the job, though, was the lesson God taught me about obedience. It doesn’t always feel good. It doesn’t always make sense. It isn’t easy, or convenient, or fun. But, when I choose obedience, God can make even an unpleasant experience blessed. What a mighty God we serve. And how gracious, able to take my rotten attitude and bless me as a result. 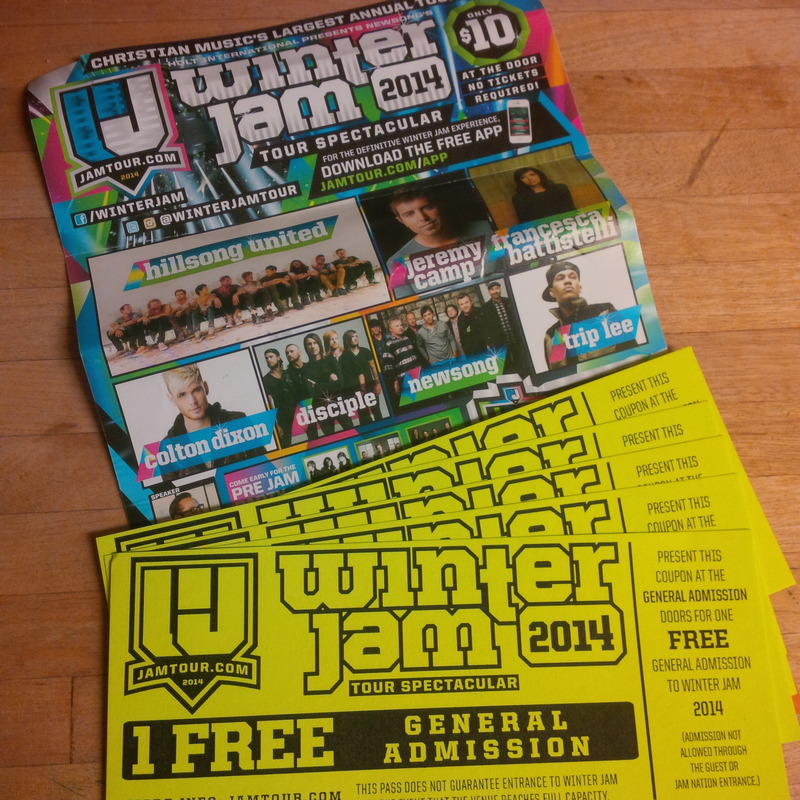 We were blessed with tickets to WinterJam recently; what a crazy, amazing evening we had. Because you buy tickets at the door, people started lining up hours before the concert started. 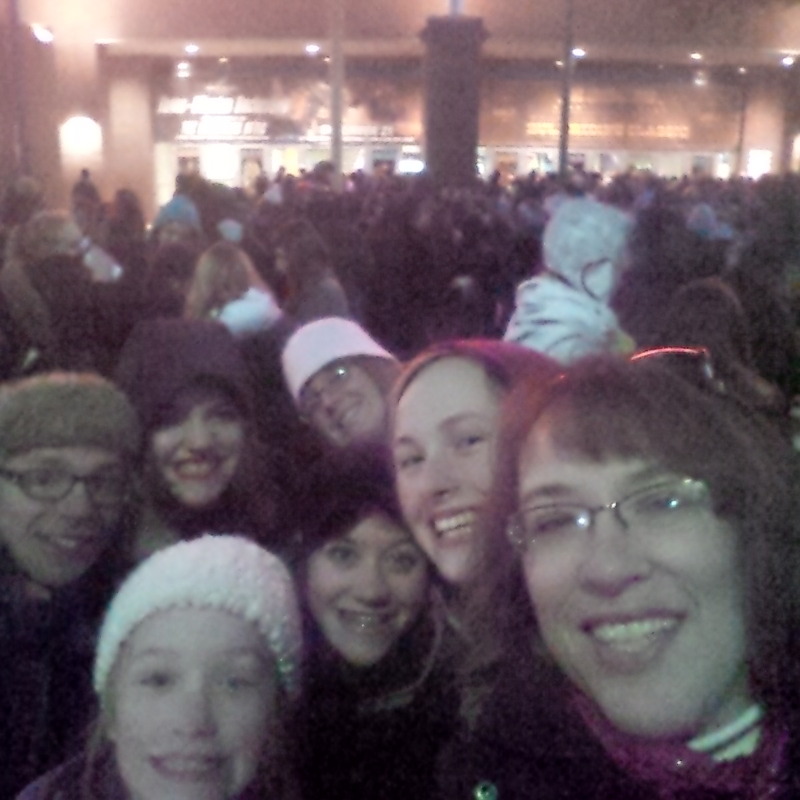 We were there pretty early (about four hours), making memories that will last a lifetime. And while I’m not a big concert fan (it is too loud, not because I’m too old but because I want to be able to hear when I am old, lol), it was a delightful evening. But one genre, equally unfamiliar, caught my attention. Trip Lee, a black rap/hip hop artist, shared a couple of “ballad raps” that were incredibly powerful. One in particular really spoke to my heart. The title is “Sweet Victory“. The words that caught my attention, though, were the beginning phrases and the chorus…”I feel thorns where my crown was…”. 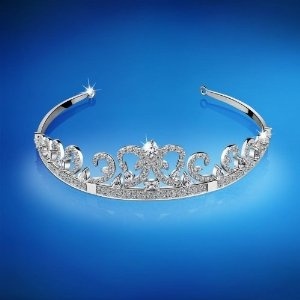 God seems to be taking me back to revisit the whole idea of keeping my crown on. For some reason (innocence?) I thought with such a powerful lesson, it would be “one and done”. I wouldn’t have to take another trip around Mt. Sinai with this one. But I do, and I am. The onion is smaller now…another whole layer peeled back (can there really be anything left?). But the concept is the same; my value is not based on my performance. I’m struggling because as often as I repeat that statement, it still feels like my value is determined by my performance. And I hoped, beyond hope, that somehow I could guarantee an outcome by my performance?! That was wrong…totally wrong. Outcomes are not determined by performance. David struggled with that in the Psalms. Our Black and Hispanic brothers and sisters struggle with it on a different level today. To some degree almost anyone can identify. Performance…behavior…you can do your very best, and somebody is always going to be better, or at least appear that way on the outside. It is easy to focus on the circumstances and to accept the dunce cap (because that is so often what the world tries to squash down on our heads) instead of choosing to sit at Jesus’ feet, embracing the value we have from Him. I am still struggling, honestly. Assumptions I made about cause and effect, and illusions I entertained about controlling outcomes, and the pain of coming to grips with the way life is compared to the way I thought life would be…I definitely feel those thorns…and they are sharp, and they hurt, and I don’t like them!! They don’t feel “good” in any sense of the word. Appearances can be so deceiving. We place high esteem on people who look successful in public, admiring their financial prowess, respecting their networking savvy, or aspiring to their level of professionalism. But if you peel back the surface a little, the picture isn’t always so rosy. Even within the Church those who catapult to the forefront tend to be attractive, speak well, have dynamic personalities. It isn’t always because their theology is right, or they have a close walk with Jesus. It is often because they know how to look and play the right part. Their hearts…well, that’s a different story. But how do you evaluate a heart? And how can you tell if what you’re seeing is the real thing? That is tricky, indeed. Jesus said you can tell what kind of people you are dealing with by evaluating their fruits (Matt 7) but even that isn’t an exact science, because how do we measure fruit? If someone leads dozens of people to Christ, if their church starts growing quickly, if their sermons start going viral on YouTube, then they must be successful, right? The fruit we are supposed to produce is not converts (which is a completely different topic altogether), or church attenders, or church members. None of those are measures of success according to Scripture, though. Rather, the fruit of the Spirit laid out in Galatians 5 includes very intangible attributes like love, joy, peace, patience, kindness, goodness, gentleness, and self-control. Somewhere else, Jesus says that the world is supposed to know who His disciples are by their love one for another. Not by the size of their church, or how many people have prayed with them, or how much comes in to the offering plate. The world measures success by the wrong things. And the Church tends to follow that example. I’ve seen it on elder boards and at deaconess meetings. The men who are asked to lead, the men who are given respect – they are the ones whose businesses are doing well, who are financially comfortable, who live in nice houses and drive nice cars, and generally those who have a commanding presence when they enter a room. Lately, however, we’ve seen the consequence of honoring men who do not look the same on the inside as they do on the outside. I have personally been disappointed by failures among some of my dearest friends. And it has prompted me to ask the question, what does a true hero look like? Can a hero, like a rose, be known by other names and still be heroic? When you think of Isaiah, what comes to mind? Running and now growing weary? Or maybe God bringing beauty out of ashes. Does your opinion or perspective change if I share that Isaiah walked around naked, for three years, to prove a point? Or what about Hosea? He married a prostitute, who went back to prostitution, all so God could share a message with the people of Israel. Jeremiah is known as the weeping prophet, partly because his heart was broken by the consequences of so many ignoring his message. Even Paul, whose writings provide us with the foundation for much of our theology, had to defend his right to write the letters we now treasure. None of these men necessarily enjoyed a great deal of respect while they walked this planet. They weren’t the most impressive. We might not gravitate towards them in the narthex, or fellowship hall, or at a networking event downtown. They might not attract us, at least not at first. Jesus, according to Scripture, was nothing to attract attention. He might have even been kind of ugly, according to man’s standards. He didn’t have much in the way of material possessions. When He died His only legacy was a rag-tag bunch of social misfits, and only a handful of them, at that. By today’s standards, He would have been a dismal failure, actually. Nobody would know His name. He wouldn’t have a book contract or tour the networks doing the talk shows; nobody would find Him that interesting. But Jesus is certainly worth reconsidering. And I don’t know about you, but I’d rather spend a long elevator ride with Isaiah, Jeremiah, Hosea, or Paul rather than any of the top name Christian leaders today. No offense or disrespect to men like Louis Giglio, or Rick Warren, or Francis Chan, or even Dr. Tim Keller, but if I was going to choose between them and the Bible heroes I’ve already mentioned, I’d choose the Bible heroes! Although, I must admit that Dr. Keller would definitely be up there pretty high. In the Body of Christ today, we need to change our metric for success. We need to move back to valuing the character qualities that Jesus valued…not earthly success or skill sets or charisma. We need to look for leaders in whom we see the fruit of the Spirit, who demonstrate maturity in dealing with conflict, who demonstrate character and integrity regardless of how their business does or how tidy their yard is…people who walk with Jesus, not just talk about Him. If we will focus on what really matters, if we measure heroes more by their character and less by their charisma, if we look for evidence of the Spirit working in and through people’s lives (which is not measured by numbers of converts), we might be surprised by what we see happen in the Body of Christ, and indeed, in our nation.